Fumiko Shimabukuro with a broad smile during the celebration on September 27 in front of U.S. military Camp Schwab in Henoko, Nago City. “Grandma Fumiko is everyone’s sun, smile, and courage. 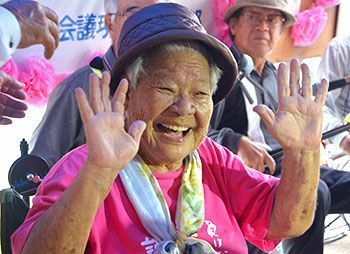 ” On September 27 in a tent in front of U.S. military Camp Schwab in Henoko, Nago City of Okinawa Prefecture, Fumiko Shimabukuro celebrated her tokachi, or 88th birthday. She had been participating in the multi-day sit-in protest. The tent was bustling with about 400 citizens who came to celebrate. “I’m the happiest person in the world. It’s a celebration like no other,” she said. Shimabukuro exchanged handshakes with many people and would occasionally wipe away her tears. Decorating began early in the morning. Sake and food from in and out of Okinawa were lined up and the citizens danced to their hearts’ content as they celebrated Shimabukuro’s longevity. Near Shimabukuro sat her older sister, Nobuko, age 91, who came from Kume Island. “This is a wonderful day. How happy we are,” she said. She kept glancing at her younger sister Fumiko. When Shimabukuro took the microphone at the very end to say a couple words, it was followed by cheers and the loudest round of applause of the entire day. Shimabukuro said, “We will keep trying until the base is gone. My kajimaayaa (97th birthday) cannot be celebrated here. Everyone, please lend us your strength until the base is gone.